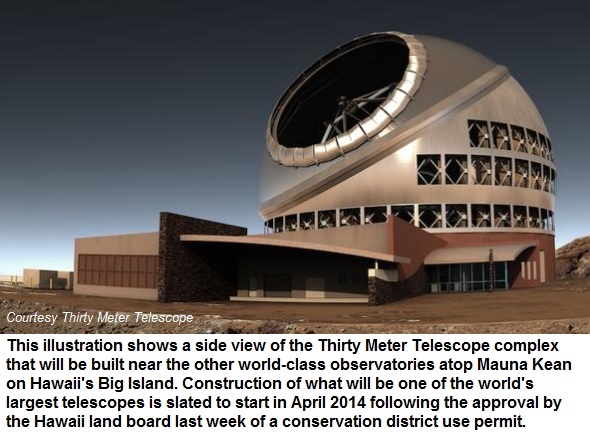 A plan by California and Canadian universities to build the world’s largest telescope at the summit of Hawaii’s Mauna Kea volcano received approval from the state Board of Land and Natural Resources. 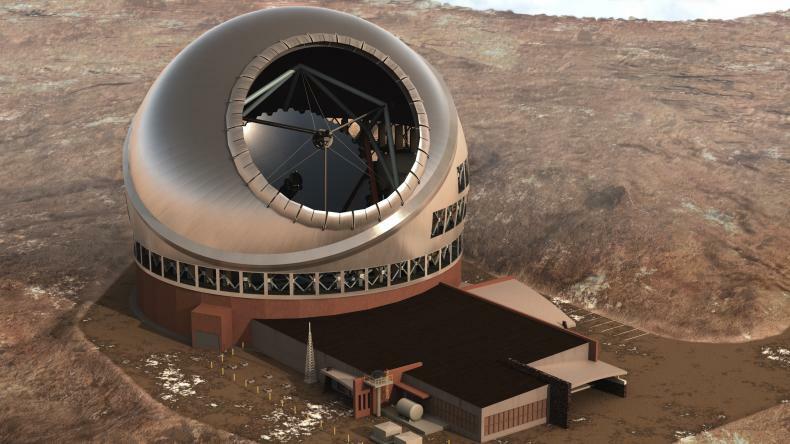 The decision clears the way for the group managing the Thirty Meter Telescope project to negotiate a sublease for land with the University of Hawaii. The telescope would be able to observe planets that orbit stars other than the sun and enable astronomers to watch new planets and stars being formed. It should also help scientists see some 13 billion light years away for a glimpse into the early years of the universe. The telescope’s segmented primary mirror, which is nearly 100 feet (30 meters) long, will give it nine times the collecting area of the largest optical telescopes in use today. Its images will also be three times sharper. But the telescope may not hold the world’s largest title for long. A group of European countries plans to build the European Extremely Large Telescope, which will have a 138-foot (42-meter)-long mirror. Some Native Hawaiian groups had petitioned against the project, arguing it would defile the mountain’s sacred summit. Native Hawaiian tradition holds that high altitudes are sacred and are a gateway to heaven. In the past, only high chiefs and priests were allowed at Mauna Kea’s summit. The mountain is home to one confirmed burial site and perhaps four more. Environmentalists also petitioned to stop the telescope on the grounds it would harm habitat for the rare wekiu bug. The board approved the project anyway, but imposed two dozen conditions including a requirement that employees be trained in culture and natural resources. The University of California system, the California Institute of Technology and the Association of Canadian Universities for Research in Astronomy are spearheading the telescope. China, India and Japan have signed on to be partners. The University of Hawaii is involved because it leases the summit land from the state of Hawaii. The nonprofit TMT Observatory Corporation was founded in June 2003 by its partners: the Association of Canadian Universities for Research in Astronomy (ACURA), the University of California (UC), and the California Institute of Technology (Caltech). The TMT project was born out of the merging of three earlier large-telescope projects: CELT, the California Extremely Large Telescope, which was a partnership between Caltech and UC; VLOT, the Very Large Optical Telescope, led by ACURA; and GSMT, the Giant Segmented Mirror Telescope, which was a partnership between the National Optical Astronomical Observatory (NOAO) and the Gemini Observatory. AURA was a partner in the TMT at the early phase. These independent projects were pursuing similar goals: to marshal lessons-learned from today’s leading observatories and use that foundation to push the frontiers of technology thereby enabling astronomy research that has proven to be beyond the current generation of frontline facilities. Helping to guide the decision to build a 30-meter class optical telescope was the 2001 publication Astronomy and Astrophysics in the New Millennium by the Astronomy and Astrophysics Survey Committee of the National Academy of Sciences. The committee was charged with surveying both ground- and space-based astronomy and recommending priorities for new initiatives in the decade 2000 to 2010. The committee’s top ground-based recommendation and second priority overall was a 30-meter-class ground-based telescope that would be a powerful complement to the James Webb Space Telescope in tracing the evolution of galaxies and the formation of stars and planets. Specifically, the committee acknowledged the need to have unique capabilities in studying the evolution of the intergalactic medium and the history of star formation in our galaxy and its nearest neighbors. This telescope would use adaptive optics to achieve diffraction-limited imaging and unprecedented light-gathering power. This recommendation was mirrored by the Canadian government in their recommendations for future major astronomy research projects. In 2003, the TMT convened a Science Advisory Committee made up of representatives from the partner institutions and the broader science community to help match the technical capabilities of the TMT with the demands of the scientific community for a next-generation observatory. Their efforts were instrumental in forging the Detailed Science Case for TMT, which continues to guide the design of the project. In April 2005, the TMT partners commited $17.5 million to the project office. Also that month, the TMT board appointed a project director and began the formal design and development of the observatory, the telescope, and its instruments. In 2006, TMT underwent a Design Review and Cost Review, the preparation for which led to a much more refined and detailed plan for TMT. In 2008, the National Optical Astronomy Observatory of Japan (NAOJ) joined TMT as a participating institution. In March 2009, TMT successfully completed its five-year Design Development Phase (DDP) with $77.1 million of funding provided by the Gordon and Betty Moore Foundation, the Association of Canadian Universities for Research in Astronomy, and the Association of Universities for Research in Astronomy. On April 1, 2009, TMT commenced its Early Construction Phase with the initial $30 million of a $200 million commitment by the Moore Foundation toward the further development and construction of the project. Matching gifts from the California Institute of Technology and the University of California are expected to bring the total to $300 million. In 2009, the National Astronomical Observatories of the Chinese Academy of Sciences joined TMT as an observer.